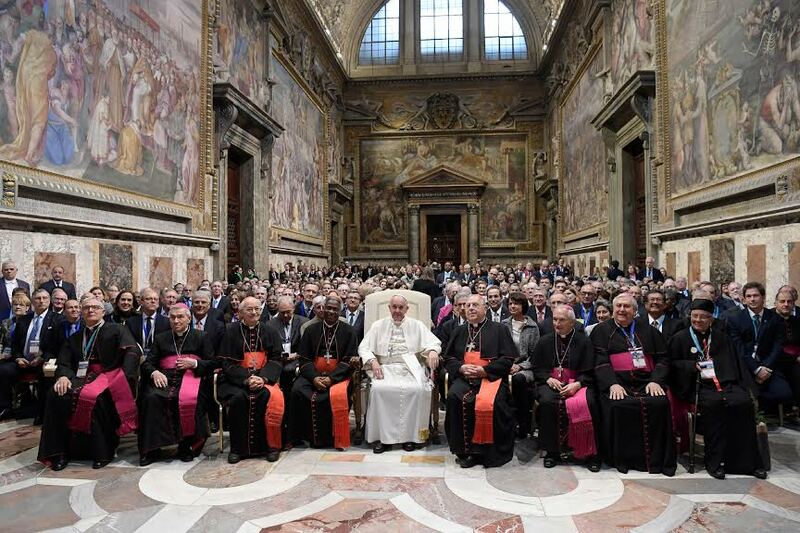 At 11:45 o’clock this morning, Pope Francis received in audience in the Regia Hall of the Vatican’s Apostolic Palace, the participants in the International Conference of Catholic Businessmen’s Associations (UNIAPAC). Here is a translation of the Pope’s address to those present. You have come to Rome – to the Vatican – in response to an invitation of Cardinal Peter Turkson and of the Authorities of the International Union of Catholic Businessmen, with the noble purpose to reflect on the role of businessmen as agents of economic and social inclusion. I wish to assure you from this moment of my encouragement and my prayer for this endeavor. God’s Providence willed that this meeting of UNIAPAC should coincide with the conclusion of the Extraordinary Jubilee of Mercy. All human activities, including the entrepreneurial, can be an exercise of mercy, which is participation in the love of God for men. Entrepreneurial activity constantly assumes a multitude of risks. In the parables of the hidden treasure in a field (cf. Matthew 13:44) and of the precious pearl (cf. Matthew 13:45), Jesus compares the obtaining of the Kingdom of Heaven with entrepreneurial risk. I wish to reflect on these three risks with you today: the risk of using money well, the risk of honesty and the risk of fraternity. In the first place, the risk of the use of money — to speak of businesses puts us immediately in relation with one of the most difficult subjects of moral perception: money. I have said several times that “money is the devil’s manure,” repeating what the Holy Fathers said. Moreover, Leo XIII, who initiated the Social Doctrine of the Church, noted that the history of the 19th century had divided “nations into two classes of citizens, opening an immense abyss between one and the other (Encyclical Letter Rerum Novarum, 35). Forty years later, Pius XI foresaw the growth of an “international imperialism of money” (Encyclical Letter Quadragesimo Anno, 109). Forty years after that, Paul VI, referring to Rerum Novarum, lamented that the excessive concentration of means and powers “can lead to a new abusive form of economic dictatorship in the social, cultural and also the political field” (Apostolic Letter Octogesima Adveniens, 44). In the parable of the unjust administrator, Jesus exhorts to make friends by means of unrighteous mammon, so that when it fails they may receive you into the eternal habitations (cf. Luke 16:9-15). All the Fathers of the Church interpreted these words in the sense that riches are good when they are placed at the service of one’s neighbor, otherwise they are iniquitous (cf. Catena Aurea: Gospel according to Saint Luke, 16:8-13). Therefore, money must serve, instead of governing. Money is only a technical instrument of inter-mediation, of comparison of values and rights, of fulfilment of obligations and of savings. As all technology, money does not have a neutral value, but it acquires value according to the end and the circumstances in which it is used. When the neutrality of money is affirmed, one is falling into its power. Businesses should not exist to earn money, although money is useful to measure their functioning. Businesses exist to serve. Therefore, it is urgent to recover the social meaning of the financial and banking activity, with the best and inventive intelligence of businessmen. This implies taking the risk of complicating one’s life, having to give up certain economic earnings. Credit should be accessible for families’ housing, for small and medium businesses, for farmers, for educational activities, especially at the primary level, for general health, for the improvement and integration of the poorest urban nuclei. A chrematistic logic of the market, makes credit more accessible and cheaper for those who have more means; and more expense and difficult for those who have less, to the point of leaving the poorest fringes of the population in the hands of unscrupulous usurers. Likewise, at the international level, the financing of the poorest countries easily becomes a usurious activity. This is one of the great challenges for the business sector and for economists in general, who are called to obtain a stable and sufficient flow of credit that excludes no one and that can be redeemable in just and accessible conditions. Even when the possibility is admitted of creating business mechanisms that are accessible to all and function in benefit of all, it must be recognized that there will always be a need for genuine and abundant gratuitousness. There will also be a need for the State’s intervention to protect certain collective goods and ensure the satisfaction of fundamental human needs. My Predecessor, Saint John Paul II, affirmed that to ignore this leads to “‘idolatry’ of the market” (Encyclical Letter Centesimus Annus, 40). There is a second risk that must be assumed by businessmen – the risk of honesty. Corruption is the worst social plague. It is the lie of seeking personal advantage or of one’s group under the appearances of a service to society. It is the destruction of the social fabric under the appearances of fulfilment of the law. It is the law of the jungle disguised as apparent social rationality. It is the deception and exploitation of the weakest and the least informed. It is the most crass egoism, hidden behind apparent generosity. Corruption is generated by the adoration of money and it returns to the corrupt one, prisoner of that same adoration. Corruption is a fraud of democracy, and it opens the doors to other terrible evils, such as drugs, prostitution and the trafficking of persons, slavery, the sale of organs, the traffic of arms, etc. Corruption is to make oneself a follower of the devil, father of lies. However, corruption “is not an exclusive vice of politics. There is corruption in politics, there is corruption in businesses, there is corruption in the media, there is corruption in the Churches and there is also corruption in social organizations and in Popular Movements” (Address to the Participants in the International Meeting of Popular Movements, November 5, 2016). One of the necessary conditions for social progress is the absence of corruption. It can happen that businessmen are tempted to yield to attempts of blackmail or extortion, justifying themselves with the thought of saving the business and its community of workers, or thinking that in this way they will make the business grow and that one day they will be able to be free of that plague. Moreover, it can happen that they fall into the temptation of thinking that it is something that everyone does, and that little acts of corruption geared to obtaining small advantages are not of great importance. Any attempt at corruption, active or passive, is already to begin to adore the god money. The third risk is that of fraternity. We recalled how Saint John Paul II taught us that “Beyond the logic of exchanges [..] there is “something that is due to man because he is man,” in virtue of his “eminent dignity” (Encyclical Letter Centesimus Annus, 34). Benedict XVI also insisted on the importance of gratuitousness, as an inalienable element of social and economic life. He said: “the charity of truth puts man before the amazing experience of gift, […] which manifests and develops his transcendent dimension. […] Economic, social and political development needs […] to make room for the principle of gratuitousness as expression of fraternity” (Encyclical Letter Caritas in Veritate, 34). Entrepreneurial activity must always include the element of gratuitousness. Relations of justice between directors and workers must be respected and exacted by all parts; however, at the same time, a business is a community of work in which all deserve respect and fraternal appreciation by their superiors, colleagues and subordinates. Respect of the other as brother must be extended also to the local community in which the business is physically located and, in a certain way, all juridical and economic relations of the business must be moderated, enveloped in an environment of respect and fraternity. There is no lack of examples of solidaristic actions in favor of the neediest, carried out by the staff of businesses, clinics, Universities or other communities of work or study. This should be a usual way of acting, fruit of profound convictions on everyone’s part, avoiding its becoming an occasional activity to pacify the conscience or, worse yet, a means to obtain an publicity return. In regard to fraternity, I cannot fail to share with you the subject of migrations and refugees, which oppresses our hearts. Today, migrations and displacements of a multitude of people in search of protection have become a dramatic human problem. The Holy See and the local Churches are making extraordinary efforts to address the causes of this situation effectively, seeking the pacification of the regions and countries at war and promoting the spirit of hospitality. However, one does not always obtain all that one desires. I ask you, also, for help. On one hand, try to convince governments to give up any sort of warlike activity. As is said in business environments: a “bad” agreement is always better than a “good” fight. Collaborate in creating sources of fitting, stable and abundant work, both in the places of origin as well as in those of arrival and, in these, both for the local population as well as for the immigrants. Immigration must be made to be an important factor of development. The majority of those of us here belong to immigrant families. Our grandparents and parents arrived from Italy, Spain, Portugal, Lebanon or other countries in South and North America, almost always in conditions of extreme poverty. They were able to raise a family, progress and even become businessmen because they met with welcoming societies, sometimes as poor as they were, but prepared to share the little they had. Maintain and transmit this spirit, which has a Christian root, manifesting here also the entrepreneurial genius. UNIAPAC and ACDE evoke in me the memory of the Argentine businessman Enrique Shaw, one of its Founders, whose cause of Beatification I was able to promote when I was Archbishop of Buenos Aires. I recommend that you follow his example and, for Catholics, appeal for his intercession to be good businessmen. The Gospel of two Sundays ago proposed to us the vocation of Zacchaeus (cf. Luke 19:1-10), that rich man, head of the tax collectors of Jericho, who climbed up a tree to be able to see Jesus, and for whom the Lord’s gaze led to his profound conversion. I hope this Conference is like Jericho’s sycamore, a tree that all can climb so that, through a scientific discussion of the aspects of entrepreneurial activity, you find Jesus’ gaze, and from this may effective guidelines result to make the activity of all your businesses promote the common good always and effectively. I thank you for this visit to the Successor of Peter, and I ask you to take my Blessing to all your employees, workers and collaborators, and to your families. And, please, do not forget to pray for me. Thank you very much.